Here I present this months mixed tape! This assortment was of course inspired by the overall theme of February being love in all its forms. 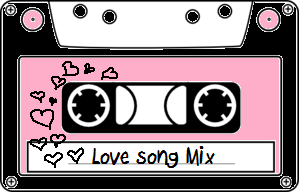 My perception of love right now is purely the romantic love between my sweetheart and I, so a few of these songs found their way from my wedding play list. You will find many favorites of mine in this mix ranging from the old to the new, and spanning several different genres. Once again all the songs are lined right up in a "mix tape" format, with each song leading you to a YouTube video, and again let me say to not judge me because of the video content, you're just supposed to listen to the music:) Enjoy! I hope you've enjoyed today's collection of love songs!! If you find a new song or artist that you really like let me know!